The kitchen remodel project is winding down. We are still waiting for granite for the island, and the appliances are scheduled for delivery on Wednesday. In anticipation of the "after" pictures, I will first post some before pictures. 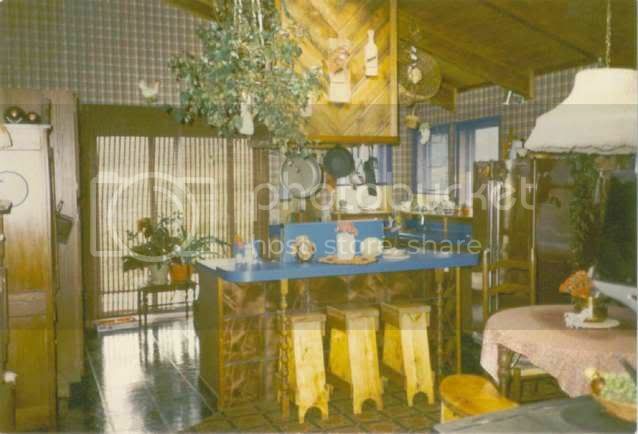 This is what the kitchen looked like the day we looked at the house with the realtor in 1986. I bear no responsibility for the decorating choices in this "before" picture. Without further comment, I'll let the picture speak for itself. Lovely archeological rendering of the 70's ... or is that early 80's ;-) ? Wow. I haven't seen blue on counters like that since my mother did it in the 70's. Thank the Lord someone figured out how to take granite and make it into counter tops. A little bit country and a little bit rock-n-roll. is this the early embyonic beginnings of folk art, yah...I'm looking forward to the after. lots of lovely light :) and what a HUGE kitchen!!! I LOVE the exposed beams & high ceiling in your home! :o) I can see why you wanted to update things. This is the first time I have posted although I have been reading for awhile now. Sorry no comments about the kitchen (I think the picture speaks for itself!) but I just wanted to touch base with you. I have also been hurt by the leadership in my church - felt a bit bruised and run over and have struggled to forgive especially as I chose to stay in the church. Your blog has been an inspiration to me though and now I can say that I am actually thankful for the experience because I do not know where I would be today if not for that happening. The experience has lead me to look closely at church and the role of church in our lives and also at my relationship with God and how that should function. I know God is drawing me to a different kind of life - the silent kind where it is enough to be his good and faithful servant and he is restoring my relationship with him. This has been long winded but the reason I wrote all this was to say that God is in control - even the bad things in life and all things work together for the good of those who love the Lord. I have been looking at the book of revelation lately where it talks about God opening the seals, scrolls and trumpets etc. The thing that stood out to me was the fact that God may not have carried out the deeds but he instigated them and was the one essentially that flipped the switch that set all the events rolling. The horrible things in revelation could not happen without God's approval and they happened in God's timing. This has helped me release my bitterness towards what happened to me because I now see that nothing can happen without God's say so and that he essentially flipped the switch and said "Now" to this event in my life because of what he wanted to achieve through it. God did it - not those church leaders or whoever else I would blame - and he did it for my good. I hope this made sense and I hope that it helps with your own journey. I'm so glad you posted. It's nice to meet you. I shared some very similar thoughts with my friends who are just now going through the difficult part of this journey. I assured them that none of what is happening has taken God by surprise. It seems that whenever my husband and I discuss this, we do eventually end up at the place of being grateful for all that we have learned through the experience. It has changed us in ways we would not have chosen, but that is good. God truly can use even the bad things in life for our benefit.